This profile is for Marvel Boy (Robert Grayson) as published by Timely Comics during the early 1950s. It’s thus the Golden Age version of the character. He was a two-fisted, sharp-eyed, science-minded, bright super-hero from another planet. Though *of course* he looked like an handsome blond, White young man. His legacy was surprisingly large. 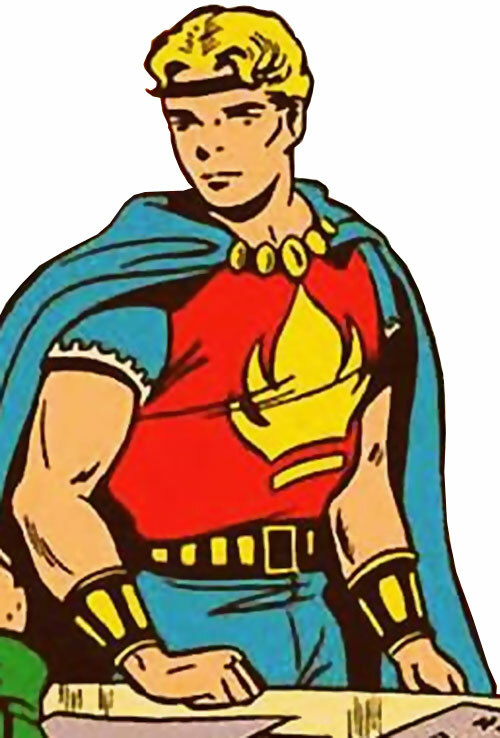 Beyond the modernised version of Marvel Boy as The Uranian, he directly inspired Quasar (Wendell Vaughn). Who in turn had an impact on many aspects of the Marvel Universe. Though the events in comics during these years aren’t directly in continuity, they inform the current Marvel Universe. For fans of vintage stories, this profile will discuss adapting the depicted event so they can be in continuity with the Marvel Universe. Real Name: Robert “Bob” Grayson. Note: Nobody ever calls him “Robert”, including his father. But his monogrammed pills box reads “RG”. Other Aliases: The Great Grayson (as a circus performer). Known Relatives: Professor Matthew Horace Grayson (father), mother (name unrevealed, deceased), sister (name unrevealed, deceased). Base Of Operations: Both the Grayson Lab on Uranus and what seems to be New York City on Earth. Height: 5’10” Weight: 170 lbs. He can run faster and fight a little harder than mortal men. He has high levels of intelligence. His IQ is 360. As long as he takes his pills to retain his Uranus-developed qualities, Marvel Boy seems abnormally strong, tough and swift. But whether he has actual superhuman strength is unclear. He also demonstrates tremendous athletic abilities. Enough to be hired as a circus aerialist and high wire performer. In keeping with his general Apollonian look, he is charismatic. The authorities will easily trust him… unless the story says they won’t. In the same vein, he seems to be a genuine hit with women. It is common for a female admirer he just met to risk her life to provide him with vital information about some nefarious plot. 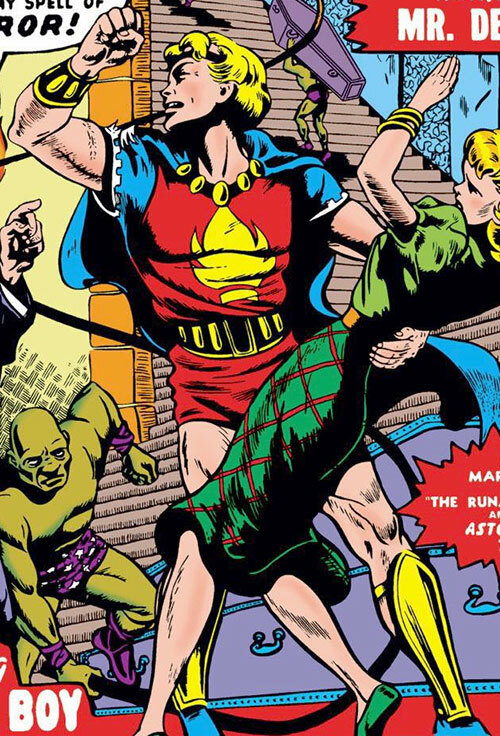 On Uranus, Marvel Boy is often aided by the members of his youth patrol. Which seems to be a paramilitary organisation of volunteers with access to armed spaceships. He also demonstrated the ability to commit long documents to memory with perfect recall. Furthermore, he has a power of “mental telepathy”. It allows him to speak all languages known by the people he’s interacting with. It can also perceive surface thoughts. Marvel Boy’s “mental telepathy” includes a heightened sixth sense. Using it, he can jump to correct conclusions based on very little information. In DC Heroes RPG terms, this is chiefly modelled by his WIL. 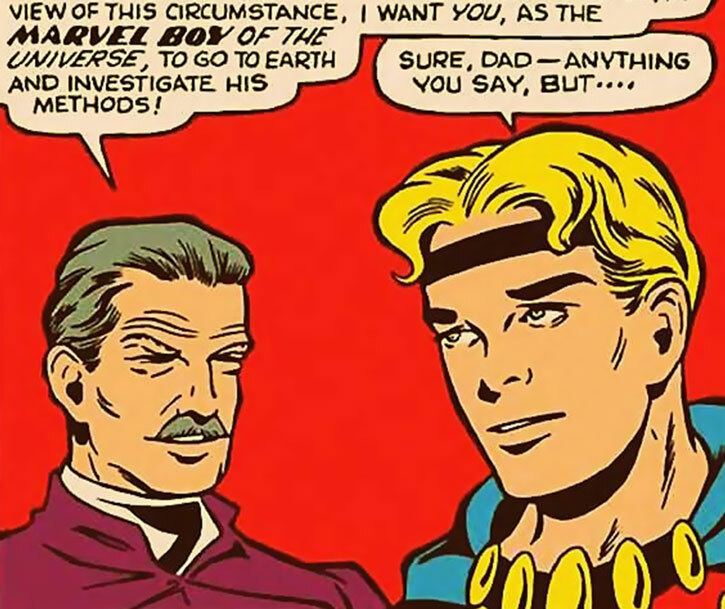 But the GM should also consider making small alterations to the plot to better correspond to Marvel Boy’s hypotheses, thus making him intuitively correct. In particular, the “this is likely a Communist plot !” hypothesis should always be correct. Even if it makes no sense. Marvel Boy once briefly used his mental telepathy to control a weak-willed zombie. But this is unusual (Power Stunt in DC Heroes, a form of Heroic Feat in DC Adventures). Originally, Marvel Boy takes special uranium pill daily. This is because Earth’s atmosphere is somewhat toxic to him. If he cannot, he will lose his Uranus-developed qualities and might eventually develop a fatal medical condition. This is what we’ve built in his game stats since it’s the original concept. However, it keeps changing. By the next story in the same issue they already work differently. 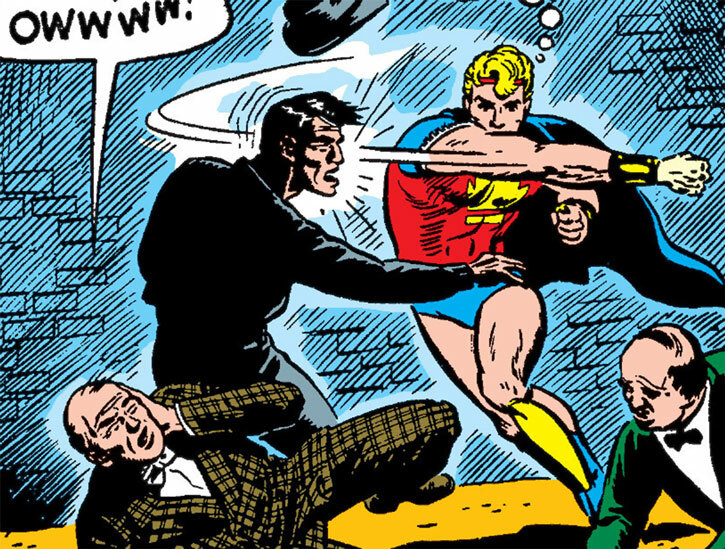 A common variant is that taking a pill turns Bob Grayson into Marvel Boy, complete with costume. There’s a vague implication that he’s not just changing into costume by taking a capsule, but has an alter-ego. A No-Prize Hypothesis is that there are two kinds of capsules. A low dosage allows his Uranus-developed powers to fade but protects his health. And a high dosage restores his Uranus-developed powers. 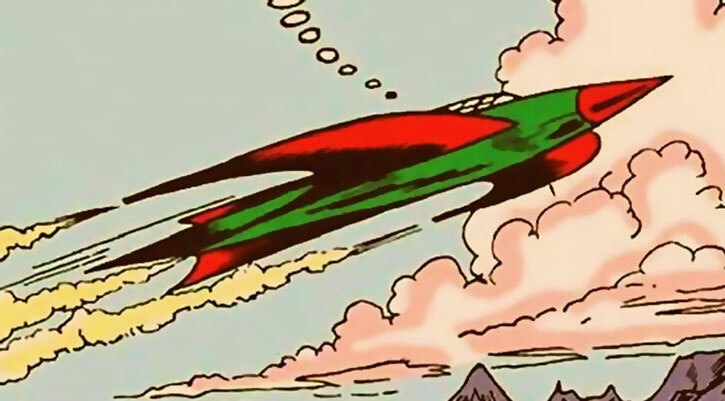 In Marvel Boy #02, swallowing an uranium pill apparently allows him to fly (conservatively modelled as Jumping) and basks him in an energy aura. This too was reminiscent of a super-heroic alter ego. Marvel Boy sports less-than-lethal weapons. These are wristbands with large gemstones that can project a dazzling beam of light. These bracers were built by his father, who forbade him to kill except in defence of innocent life. He also has a flying saucer, of course. This spacecraft is practically silent, but could reach the distant planet Astros within minutes. Yet it took an hour to go from New York City to Sicily (about 4,500 miles, or 7,000 kilometres). By the second issue it becomes a sort of large starfighter rather than a saucer. It then retains this general look for the rest of the run. One of the last stories reveals that it is called the Silver Bullet. The Bullet can hold about three weeks of provisions. It also carries a small stock of scientific and exploration supplies such as oxygen masks, Geiger counters, radiation suits, etc..
Bob Grayson was born around 1931. He was the son of Professor Matthew Grayson, a semi-famous atomic scientist at Van Dyke University. His mother and older sister were killed in 1934. A Nazi anti-aircraft battery mistook their plane for a military craft and shot it down. This tragedy led Professor Grayson to the conclusion that Earth was a horrible place. He saw it as unsuitable for raising a child. His experience with the Great Depression may also have shaped his reasoning. Being a genius with special theories about atomic energy, Grayson built a nuclear-powered rocketship in secret. His goal was to leave Earth with his son and live on the Moon. However, as it was about to reach the Moon, the rocket was suddenly attracted toward Uranus. Landing on Uranus, Grayson and his young son made a staggering discovery. The atmosphere was breathable, the gravity close to 1G, and the environment somewhat Earth-like. Furthermore it was inhabited by human-looking people. These were kind, noble, peaceful and ultra-intelligent. And they all looked like White men, of course. Representatives of this perfect civilisation telepathically learned English within instants. They could thus greet the Graysons. Over the year, they helped Professor Grayson build his lab and raise his son, thanks to their median IQ of 356. Professor Grayson did not plan to abandon Earth, though. Bob grew up to possess quasi-superhuman abilities thanks to Uranian education and training. When Bob reached his 20s, his father asked him to return to Earth. The mission was to save it from self-destruction by combating all evil elements, political and criminal. Professor Grayson was now too old to make the trip back. But he prepared special pills for Bob to withstand the Terran atmosphere. Plus a flying saucer and non-lethal weaponry. What spurred the older Grayson into action was the emergence of a new continent on Earth. This triggered tectonic catastrophes, plus a claim-staking race between Cold War militaries. However, it was the heimatloss pirate Count Varron, whose ship had been caught by the emerging land mass, who first laid claim to it. Bob Grayson’s flying saucer soon investigated the new continent. Marvel Boy soon met the natives. This civilisation had been trapped underground 1,200 years prior, and had adapted to life under the sea. However, the pirates attacked them to stake their claim to the land. Shocked by this brutality the natives sunk the landmass they had raised. They also abandoned their plans to return to surface life. (This story could still be in continuity, with the natives being a lost Atlantean colony or an Inhuman offshoot (like the Bird People who adopted Red Raven). And the “continent” being just a strategically-placed island). Bob Grayson then became a science journalist, for the American Daily Monitor. After he arranged for an interview with one Professor Heathrow Vance, he saw Vance gain powers in an accident. Professor Vance became the villainous Great Video. But Marvel Boy foiled him and depowered him. Professor Grayson then detected large meteors headed for Earth. He had his son investigate. Marvel Boy determined that it was a plot by the Astro-Men. Their leader, Saramin, Emperor of the Seven Orbits of the Universe, was bombarding Earth. It was done using giant blasting guns to propel bits of the Astro-Men’s planet, Astros. 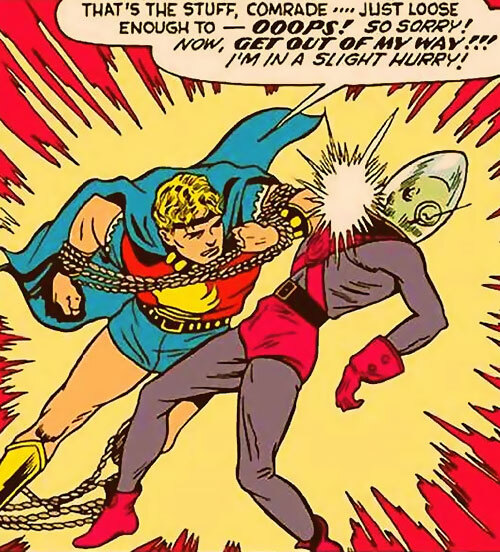 The Astro-Men captured Marvel Boy. But he escaped and returned to Earth just as the first meteors hit, with devastating effects. 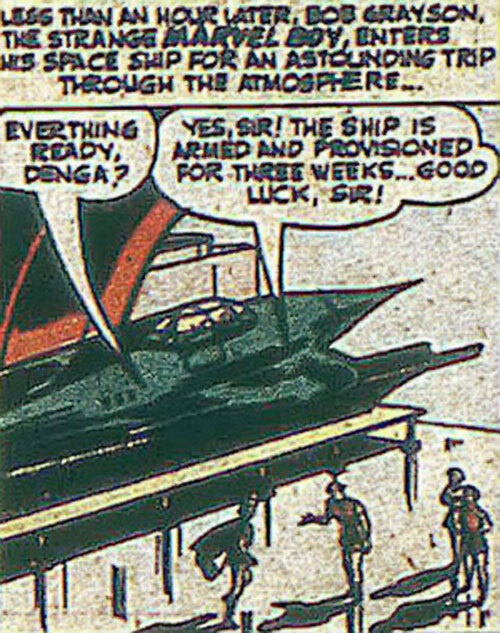 Briefing the United Nations, Marvel Boy had them combine global knowledge of atomic energy. They thus built super-cannons that could destroy the incoming meteors. The dastardly “Eastern Union” refused to join the effort, but the repulse-guns were successful. When the Astro-Men invaded they thus encountered stiff resistance from the UN. Ultimately, Earth’s air forces were victorious. Emperor Saramin was captured. At this point the despicable Eastern Union launched an all-out assault against the United Nations. Marvel Boy swiftly flew to Astros with Saramin. From there they launched more meteors at the fiendish godless Communist aggressors, pummelling them into surrendering. Horrified by the damage wrought to Earth — as Astros had never known total war — Saramin had his Astro-Men come live on Earth to help with the rebuilding. Marvel Boy then became an insurance investigator for Amalgamated Insurance Company. He was sent to investigate suspicious fires at a circus. Grayson was hired as an aerialist (heh 🙂 ) as his cover. Discussing with equestrienne Starr Ryder led him to suspect Marvo the Mind-Reader of wrongdoing. Marvo tried to kill him by stealing his uranium pills. But Grayson nevertheless exposed his schemes. Ryder then established herself in Los Angeles and became a contact of Marvel Boy, seemingly having a romantic interest in him. Starr Ryder and another young Angeleno, Pete Mason, learned that immense underground fires raged in Pennsylvania coal mines. These couldn’t be put out. They summoned Marvel Boy from Uranus to investigate. Correctly assuming that such a fire could only be a Communist plot, Marvel Boy arrested the scheming mine owners. He then blasted the main fire using crushed uranium capsules. Conventional firefighting could handle the rest. Bob Grayson’s next insurance investigation was about one Omar Khayam Rasch. He was the head of a spiritualist cult. Rasch was the main beneficiary of too many life insurance policies. And the owners of these had a marked tendency to die. The ostensibly Middle-Eastern Rasch inevitably turned out to be the head of a criminal Satanist Muslim death cult. So I guess it was a Tuesday. Grayson discovered this thanks to a female admirer within the cult. Marvel Boy presented a tight case to his employer and the police. The cult was taken down. As it turned out, even the perfect Uranian society was not immune to the dreadful perils of Communism engineered by evil foreigners. Marvel Boy determined that the rabble-rousers were backed by spies from the planet Satana. Tuesday again, I reckon. After violently dispersing the crowds, Marvel Boy left for Satana. There he assaulted guards and kidnapped the Princess. He also discovered that Satana’s orbit was decaying. As a consequence, the locals were scheming to invade Uranus before their home world plunged into their sun. But stalwart Uranian scientists could then devise a solution to stabilise Satana’s orbit. Marvel Boy sent the Princess back with the equations. Marvel Boy then stopped a Communist plot involving bombs planted in major FBI installations. Some time later he flew to Sicily to rescue Starr Ryder’s father. This archaeologist had been capture by a vampire, Madame La Morte. Reestablished the inflow of water. Vanquished the rogue police with the help of his youth patrol. In 1951, Ms. Diana Frost requested the services an insurance investigator. The police did not believe her fantastic story about being harassed by the ghost of her father. Within hours, Marvel Boy discovered that the “ghost” was the still-living Mr. Frost. He was in cahoots with the family doctor to kill Ms. Frost. It was she who had inherited everything from Mr. Frost’s late wife. And they would have gotten away with it, too, if not for this meddling kid ! 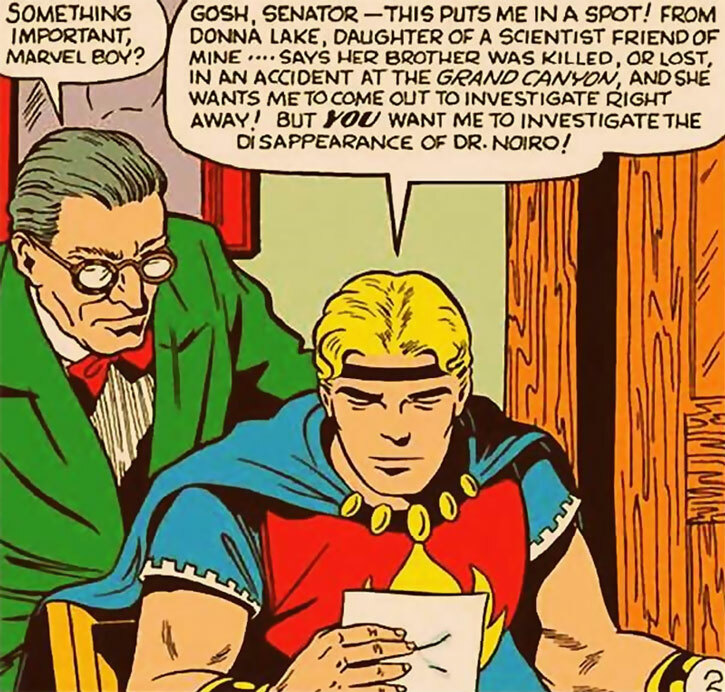 Marvel Boy’s next case involved the kidnapping of Dr. Noiro, a key scientist working on atomic research. Then the resurgence of an ancient Native American curse killing White men who approached the Grand Canyon. This was all an alien plot masterminded by Origin Rex, an agent from another constellation. And presumably a Communist. Rex kidnapped Marvel Boy. But the hero escaped and nuked the Grand Canyon with the help of the US military. He then arrested Origin Rex. 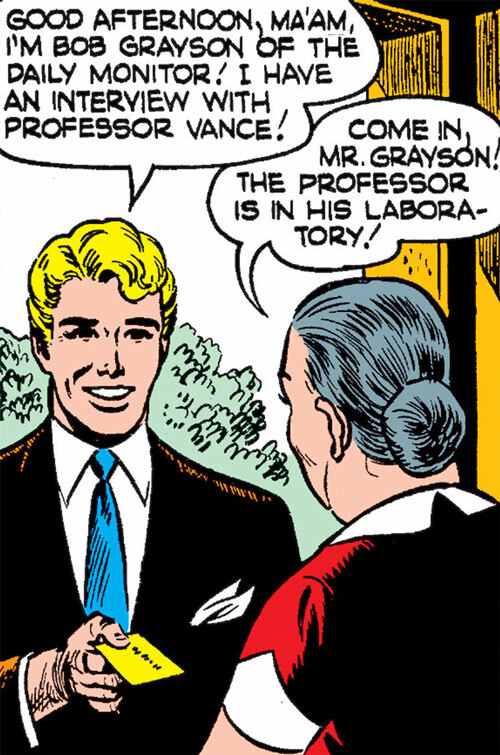 Marvel Boy had deduced that the quasi-human crypto-commie had been Dr. Noiro all along. Because it is “Orion” spelled backward ! Rogue Uranians attempted to extort atomic secrets from Marvel Boy. They kidnapped Professor Grayson in his lab, and a young Uranian named Lilli on Earth. But Marvel Boy turned the tables on the guys on Uranus. He then beat them up until they agreed to send a message to Earth. This lured their accomplices into a police trap. Marvel Boy was next sent to debunk the act of an amazing magician. This man turned out to be a powerful time traveller. Then he once again ran into a dastardly Communist plot. A mind-controlling pen was being used to force an American millionaire to send enormous checks to the Soviet government. Finally, Bob Grayson foiled the plot of Professor Diminutio. He was an alien scientist who had invented a special fabric. Such garments would suddenly and forcefully shrunk when in contact with human flesh. Diminutio’s plan was to have clothing made out of the fabric so as to murder the entire American population through their attire. However, Marvel Boy recognised the material. He then tricked Diminutio, arresting him and seizing his stocks of fabric. 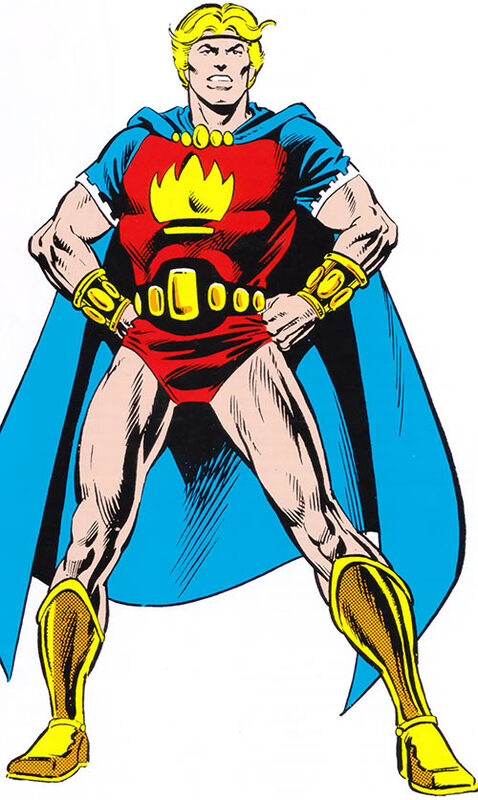 And that was it… until, as usual, Roy Thomas brought him back after a fashion. 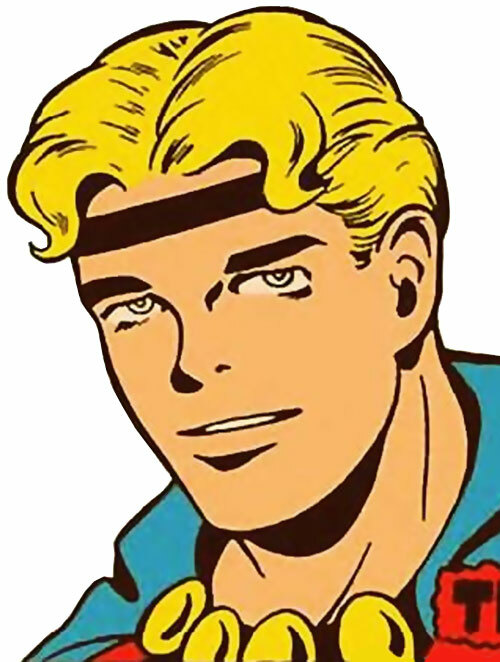 Marvel Boy is a clear-eyed, superiorly intelligent and dedicated Hero. He’s fearless and quick-thinking. Grayson is at once a fighter, a technologist, a leader, an investigator, etc. as well as a superior specimen endlessly struggling for the common good. 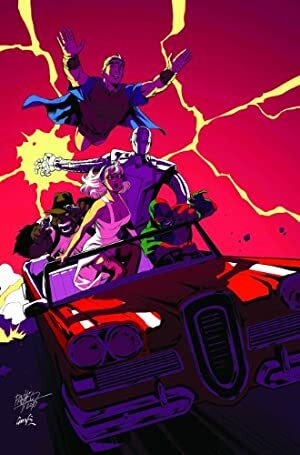 The super-hero stories are often hybridised with other genres. 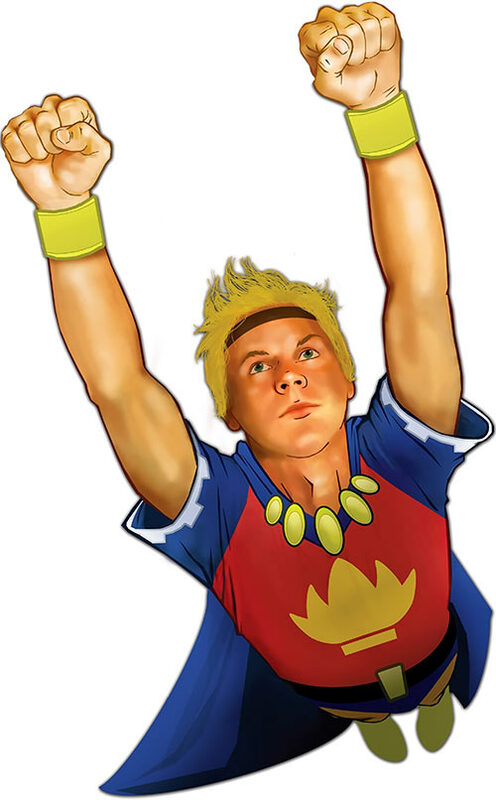 Marvel Boy will thus commonly act like a daring air ace sort of hero. Or a daring two-fisted international adventurer. In the detective-type stories, he becomes an observant sleuth who explains how he pieced together the case in a huge word balloon at the end. 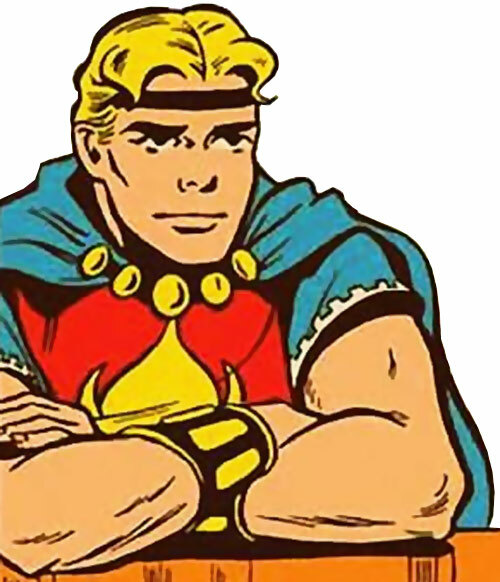 One of his few distinctive features (aside from his strong Apollonian vibe) is that he’s a positivist hero. He’s striving for SCIENCE! and the wonders of modern atomic energy. His solutions often involve “atomic science”. He’s also quick to show disdain toward the supposedly supernatural. 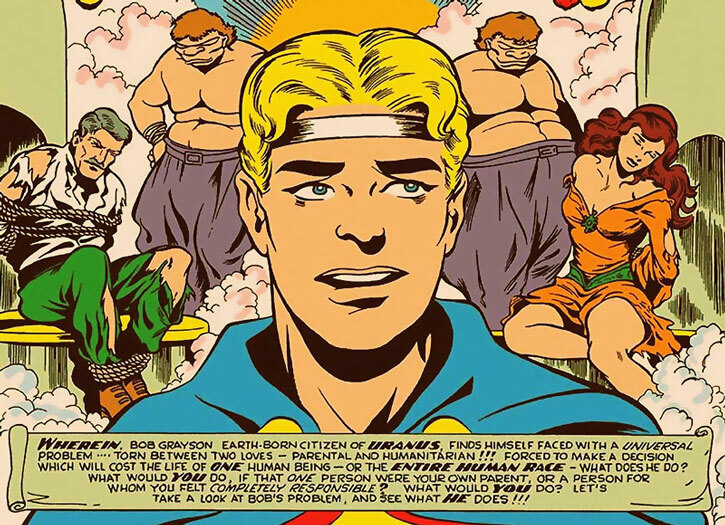 Unlike many 1950s American comic book heroes, Marvel Boy III is not actively xenophobic. It, uuuhh, just turns out that the Communists, Muslims, Indians, etc. he encounters are all intrinsically and irredeemably evil, vicious and murderous. Originally, Marvel Boy is ethical in his dealings with everyone. But he soons aligns with the Atlas Comics anti-Communist screed. This means that normal rules of conduct cease to apply when it comes to Communists (or quasi-Communists). And that Uranus suddenly ceases being a perfect society as the evils of Communism threaten everyone. Marvel Boy doesn’t have a secret ID. People know that Bob Grayson of Amalgamated Insurance is the science hero from Uranus. 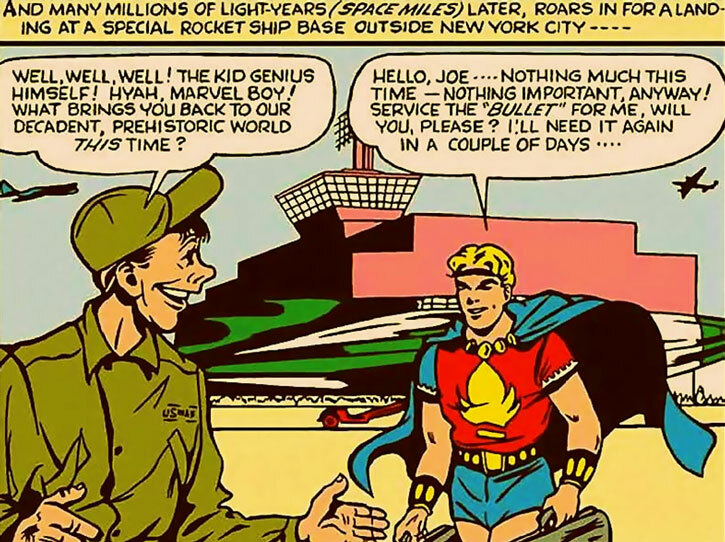 In the DCU, Marvel Boy could replace the “Starman of 1951”. In the DCU this Starman was an alternate identity briefly used by Bruce Wayne (pre-Crisis) or Charles McNider (post-Crisis). It was involved in a few time-travel adventures with modern bearers of the Starman name. In this hypothesis, Starman (Bob Grayson) would have been active for a few years. 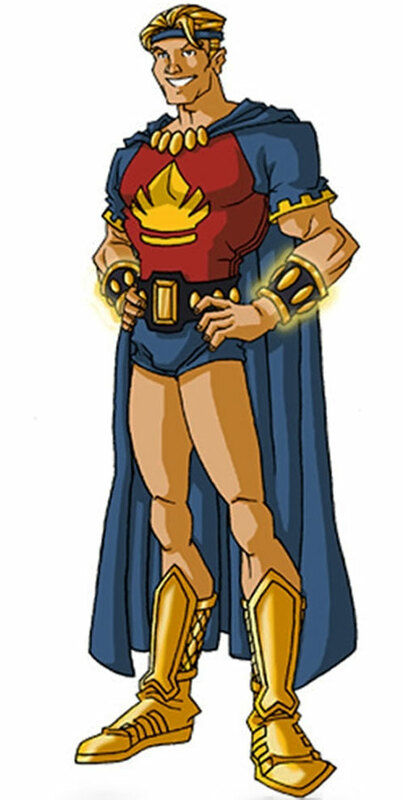 He would have been sent to Earth from Uranus to hold the line after the Justice Society disbanded. He chiefly would have fought against… wait for it… Communists. 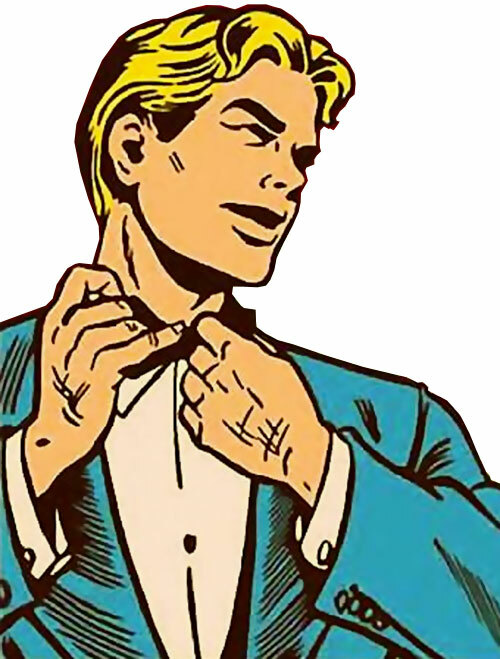 Bob Grayson was the third Marvel Boy. 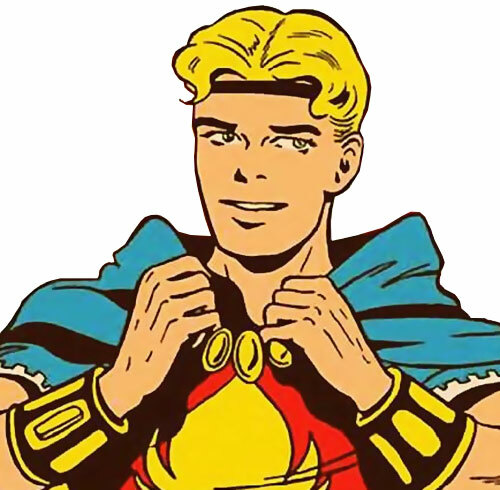 He followed on the heels of two brief-lived versions of Marvel Boy (Martin Burns) published by Timely Comics. He was a bit Superman-like and started in his own title. 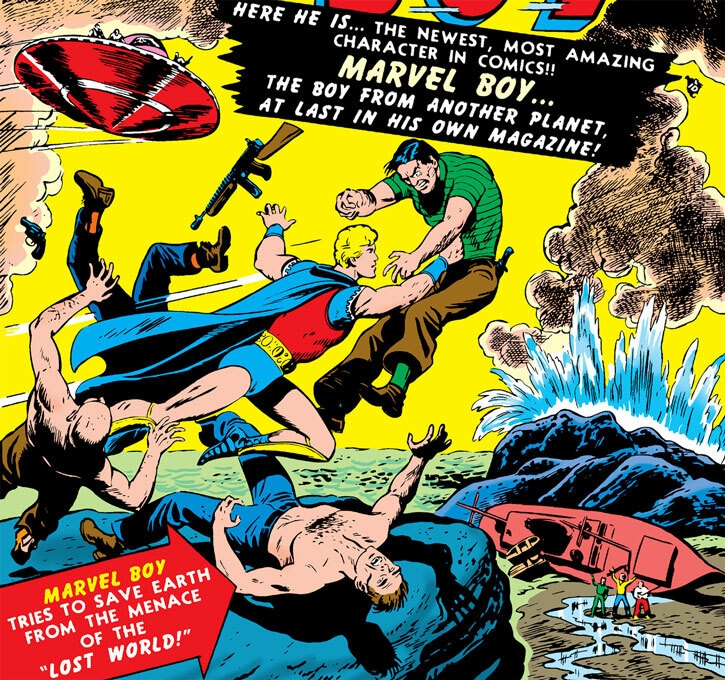 By issue #03 Marvel Boy became Astonishing. 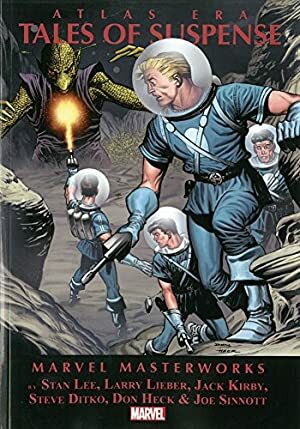 Which is not to be confused with Astonishing Tales, a later Marvel publication. The super-hero books were not faring well in the post-war environment. The key hero titles at Atlas, inherited from Timely (Human Torch, Captain America and Sub-Mariner) had been recently discontinued. 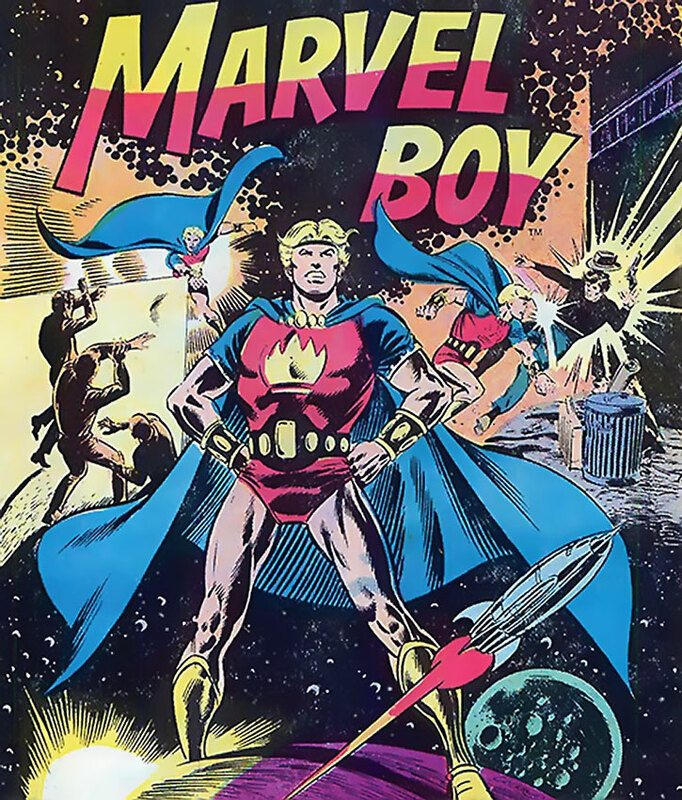 Marvel Boy was an early attempt to bring super-heroes back. But by issue #7 Astonishing had become a basic short-horror-stories-with-shock-ending anthology à la EC Comics. 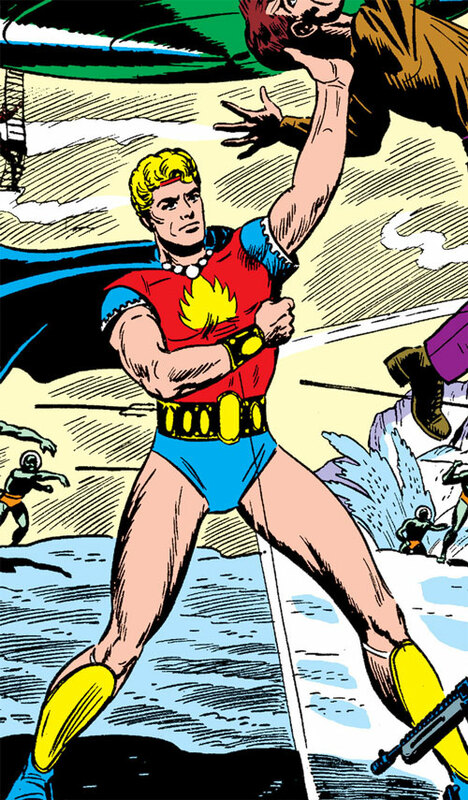 Atlas would make other attempts, such as bringing back some flagship Timely heroes in Young Men. But the resurgence of the super-hero genre would have to wait until 1956 and the arrival of Barry Allen, the new Flash, in the pages of Showcase. Which is the usual date for the start of the Silver Age . Comprehend Languages is Contingent Upon Mind Probe. Data Storage has No Transfer. Mind probe is limited to superficial thoughts. Military Science is Contingent Upon Scientist. Attractive, Confident (Professor Grayson – his father), Familiarity (Insurance fraud), Language (Uranian language), Popularity, Sharp Eye. Sharp Eye only applies to spotting clues in detective stories. Youth Patrol (High), Amalgamated Insurance Company (Low), American Police Forces (Low). Attack Vulnerability (-1CS OV/RV vs. Blindside Attacks), Oblivious, Loss Vulnerability (when breathing Earth’s atmosphere Marvel Boy must take his uranium pills every day lest all of his Attributes drop to 02 and he loses all of his Powers). Oblivious only applies when attempting to detect traps and ambushes. WRISTBANDS [BODY 12, Flash: 08]. SILVER BULLET [BODY 15 STR 12, Flight: 38, Radio communications: 20, Sealed systems: 16, Loss Vulnerability: Flight drops to 13 in an atmosphere, Advantage: Headquarters (Confined)]. 20 capsules crushed into powder and jammed into a fissure exploded when exposed to flame (Bomb: 15). He once had a young woman take a capsule, which boosted her STR score. Let’s say Enhance (STR): 01 (cap is 05). It is implied that the pills can let him function without sufficient food and water. Formally, Marvel Boy’s Attack Vulnerability should be handled as a Genre Rule. Everyone in the Genre is vulnerable to being bushwacked and hit on the head. 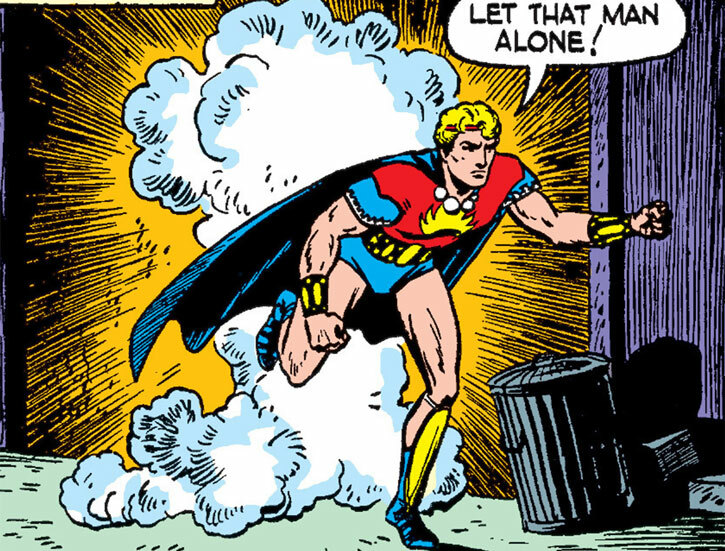 This is a common Genre Rule in 1940s and 1950s adventure and super-heroes comics. This entry treats it as an attribute of the character for convenience’s sake. – Enhanced Strength 03, Enhanced Agility 2, Enhanced Fighting 4, Enhanced Awareness 3, Enhanced Presence 1. – Leaping 5 (Limited 1 (5 uses per adventure)). – Mind reading 2 (Limited 1 to Surface Thoughts). – Benefit 1 (Marvel Boy’s intuitions are strangely accurate, and the GM should support that). Gargantuan Size, Strength 12, Flight 12, Movement (Space Travel 2), Communication (Radio) 5, Immunity 8 (All environments, all suffocation, starvation/thirst). – Immunity 1 (These seem to allow him to function without sufficient food and water). Enhanced Strength 1. This likely doesn’t work on himself. Bushwhacked! Marvel Boy’s Perception bonus when it comes to detecting ambushes and attacks from behind is zero. Our hero! Marvel Boy is a goodie-goodie, driven to help and protect his fellow man. Except, of course, Communists. The Investigation (Search) Skill models his ability to spot minute clues when he’s a detective story. GMs should thus let him use this instead of Perception even if it’s more of a visual scan than a physical search. The Unreliable Limitation to Jumping represents the fact he doesn’t use it much even when that would be advantageous. Source of Character: Marvel Boy and Astonishing comics in the Golden Age proto-Marvel Universe. Helper(s): Gareth Lewis. One illustration by RonnieThunderbolts.